Another week of knitting and yet my knitting progess appears minimal. 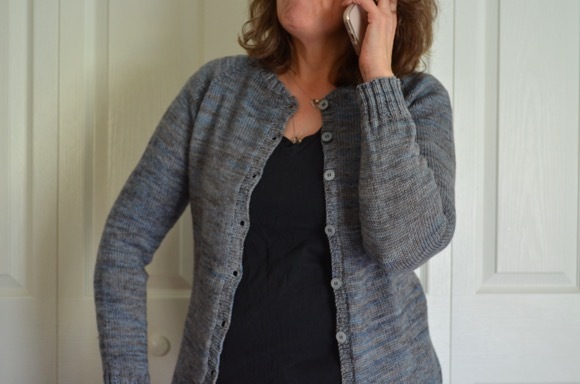 Three inches have been added to the underarm body length of my cardigan. I'm still fretting over whether I have enough yarn but I will definitely know when my current skein runs out. Based on this, I will decide what to do. I could buy another skein of wool same color but most likely in a different dye lot. I'd do the ribbing of the body and the sleeves with that new dye lot skein. I'm happy I've invented a plan. My fingers are cross that I do not need to buy more yarn! Still the first sock out of two and the socks continue to be my grab and go project. 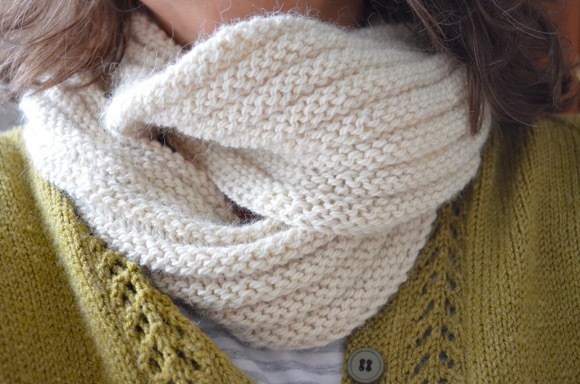 I haven't had much knitting time at work so I might start working on this project at home. I could have a different project for babysitting. I'm reading One Flew Over the Cockoo's Nest. Ordinarily I like edgy books but maybe I'm not in the mood or it's not the right time for this book. I'm sticking with reading it and I've switched to reading the novel during the day instead of right before bed. Both of my kids loved this book so I'm hoping I will as well. I'm half way through and I'm still in a 'meh' mood about it. I bought on a whim A Lantern in her Hand ebook which I read as a teen many years ago. I loved this book back then so I'm excited to re-read it and see what I think. This was one of the novels that cemented me into an avid reader. 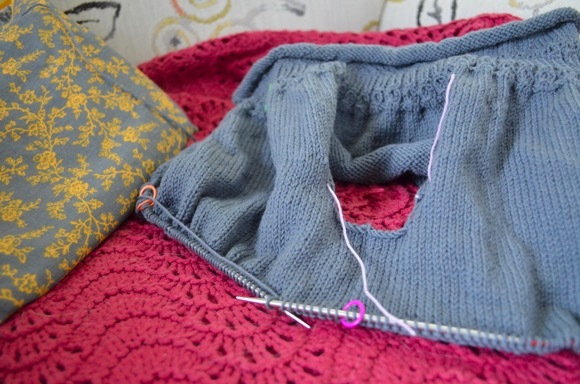 Knitting three more inches on a sweater body isn't minimal! One Flew Over the Cuckoo's Nest isn't exactly full of warm fuzziness; Nurse Ratched would give me nightmares. I hope A Lantern in Her Hand lives up your memories. Sorry for the above comment. I was having trouble commenting. Rereading a past favorite book will be fun. I hope it’s as good as the first time. I hope you find someone to help you learn, you can do it! I see the work on your sweater as great progress and it's looking good. 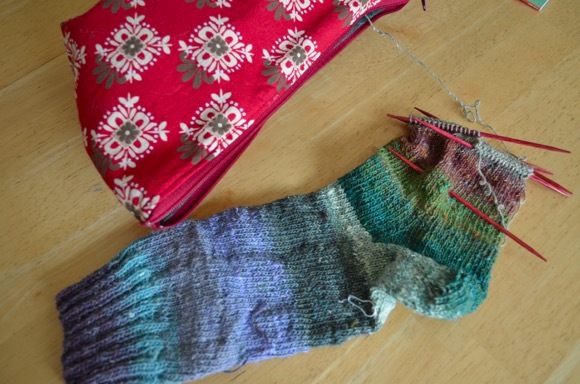 Looking at your socks I'm kicking myself for not purchasing the Noro skein I saw on sale yesterday. One flew over the Cuckoo's Nest is a wonderful read. I think you will enjoy it. I, too, think 3" is great progress on a sweater. Remember...it is NOT a race!! 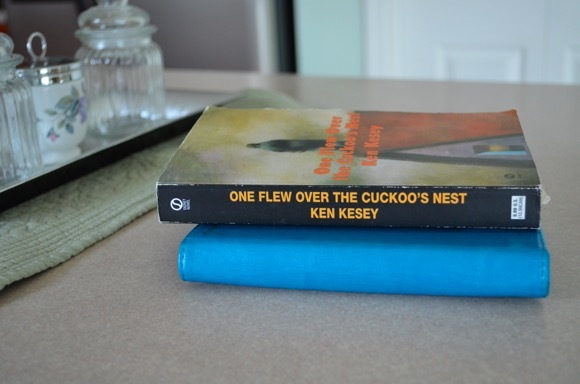 I'm not a fan of One Flew Over the Cuckoo's Nest - not a huge fan of Ken Kesey (though I've read other books by him). I'll be interested to read what you think. I haven't heard of A Lantern in Her Hand - I'm off to look that up now. I've been in (and seem to continue to be in ) a slump with reading...and I unraveled a lot last night!! I'm reading the Upward Spiral. I could not get in Cuckoo's Nest. I am currently working on a baby blanket but am having a difficult time of it. It is such a simple pattern but I think I run into trouble when I have the tv on in the background; I so quickly forget where I am in the pattern! Sigh! I'm giving it a third startover and working the pattern row without distraction; if that doesn't work then I am grateful that there is now a knitting store not far from me that has open table every day at 2:00. : ) I love the socks, they are so cheery! I'm going through the same thought process with my latest knitting project and whether I'll need to get another of a different dye lot. I've not read One Flew Over the Cuckoo's Nest. It's been on my list for a while. Hope you get into it. Slow and steady is good sweater progress. Here is hoping you win the game of yarn chicken although you have a good plan. Oh A Lantern in Her Hand - I too read that year's ago. I am rereading some titles I have kept on my shelves. Interesting how some continue to speak to me, although differently, and one or two I donated to the library. I am enjoying rereading - a benefit to aging and reading through a lens of more experience. Fingers crossed for ya on the yarn. I finished a historical romance of a series I started some time ago and moved onto the third book because I liked the second so much.